The map above shows which countries have claimed to the the successor to the Roman Empire at some point in their history (so called Third Rome). Learn more about each below. By 285 AD the Roman Empire had grown so vast that it was no longer feasible to govern all the provinces from the central seat of Rome. The Emperor Diocletian divided the Empire into halves with the Eastern Empire governed out of Byzantium (later Constantinople) and the Western Empire governed from Rome. The Western Part collapsed in 476 AD (the traditionally accepted date) and in 480 AD, with the death of the Western Emperor Julius Nepos, Eastern Emperor Zeno became sole Emperor of the Empire. The Eastern Roman Empire (aka the Byzantine Empire) continued for another thousand years until Constantinople was captured by the Ottoman forces under Mehmed II in 1453. Claims to be the successor of Rome have arisen from perceived connections to one or both of the Eastern and Western Empires. 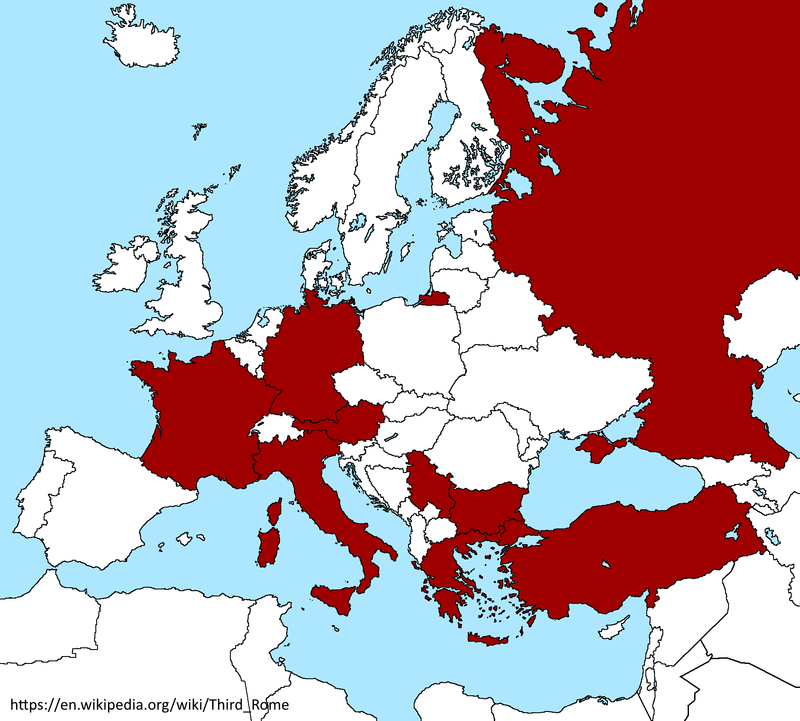 Religious traditions played an important part in establishing such connections, especially following the schism in 1054 between what are now the Roman Catholic and Eastern Orthodox churches. After the fall of Constantinople in 1453, Mehmed II declared himself Kayser-i Rum, literally “Caesar of Rome”. Mehmed’s claim rested with the concept that after the fall of the Western Roman Empire Constantinople, which he now ruled, had become the seat of the Roman Empire. Following the fall of Constantinople, Moscow became the main Orthodox Christian capital, giving rise to the concept of Moscow as the “Third Rome”. The basis for the claim was both theological (the unity of Eastern Orthodox Church) and political (the concept of the Moscow Prince as supreme sovereign and defender of Christian Orthodox nations). The idea took off under Ivan III (Ivan the Great), Grand Prince of Moscow, who greatly expanded his territory and laid the foundations of the Russian state. Ivan III also had some connection to the Byzantine throne since he had married Sophia Palaiologina, a niece of Constantine XI, the last Byzantine emperor. His grandson, Ivan IV (Ivan the Terrible), become the first Tsar of Russia (tsar, or czar, meaning caesar, is a term traditionally applied by Slavs to the Byzantine Emperors). His successors supported the idea that Moscow was the proper heir to Rome and Constantinople. The idea was finally abandoned during the Russian Revolution of 1917. The Bulgarian claim, which predated that of Russia, was based on the fact that Simeon 1 of Bulgaria was crowned Byzantine Tsar in 913 AD and was given the title “Emperor and Autocrat of all Bulgarians and Romans”. However, this title was revoked by the succeeding Byzantine government although he did continue to receive some recognition as “Emperor of the Bulgarians”. In the 14th century, as the Byzantine Empire weakened, Tarnovo, the capital of the Second Bulgarian Empire, was claimed as the “Third Rome”, based on its preeminent cultural influence in Eastern Europe. However, by the end of the century the Bulgarian Empire had fallen to the Ottomans. In the 14th century, the Serbian King Stefan Uroš IV Dušan conquered a large part of southeast Europe, becoming one of the most powerful monarchs of the era. In 1345 he proclaimed himself “Emperor (Tsar) of the Serbs and Greeks” and was crowned as such at Skopje on Easter 1346 by the Patriarchs of Serbia and Bulgaria the Archbishop of Ohrid. His imperial title was recognized by Bulgaria and various other neighbours and trading partners. The reference to the Greeks provided the link back to the Roman imperial tradition since the Byzantine or Eastern Roman Empire was largely Greek-speaking. However, his title was not recognised by the Byzantine Empire and Serbia was subsequently annexed by the Ottoman Empire in 1459. The claims of Greece as a successor to Rome were essentially aspirational and were embodied in what was termed the Megali Idea. Its aim was to revive the Byzantine or Eastern Roman Empire by establishing a Greek State that encompassed most of the former Byzantine lands with Constantinople as its capital. The term was formulated in discussions leading to the 1844 constitution, but the concept went back much further in the Greek psyche. The Megali Idea dominated foreign relations and, to a significant extent, determined the domestic politics of the Greek state for much of its first century of independence. However, it was officially abandoned following the population exchange between Greece and Turkey in 1923. Up to this point all claims have been based on establishing succession to the Eastern Roman Empire. However, Germany’s case rests upon succession to the Western Roman Empire and its Roman Catholic Church, the only Roman institution that had survived the collapse of the Empire. The key figure in this is Charlemagne, King of the Franks and the greatest of the Carolingian monarchs, who was granted the title of Emperor of the Romans by Pope Leo III in 800. Charlemagne had united much of Central and Western Europe, giving rise to what would later become known as the Holy Roman Empire. For some time, the title remained with Charlemagne’s Carolingian successors, but was later contested by Italy in a series of wars. The title was revived again in 962 when Otto I was crowned emperor, fashioning himself as the successor of Charlemagne and beginning a continuous existence of the Empire for over eight centuries. The Holy Roman Empire was never a single unified entity, comprising instead a large number of semi-autonomous territories. The office of Holy Roman Emperor was traditionally elected by the prince-electors, who were mostly German noblemen, although it was frequently controlled by dynasties, most notably the Habsburgs. The Empire was dissolved on 6 August 1806, when the Francis II, the last Holy Roman Emperor, abdicated following a military defeat by the French under Napoleon at Austerlitz. After 962 the German Confederation had been the largest territory in the Empire. Thus, when Germany was united in 1871, it claimed to be the “Third Rome” through the lineage of the Holy Roman Empire. After the Holy Roman Empire was dismantled in 1806, the Austrian Empire claimed to be its heir and, hence, the successor to Rome. The basis of the claim was that Austria’s Habsburgs had continuously occupied the throne of the Holy Roman Empire from 1438 until their extinction in the male line in 1740. When Napoleon proclaimed himself Emperor of France, he also referred to his imperial crown as the “Crown of Charlemagne”. After this, Napoleon laid his own claim to having resurrected the Roman Empire, as he had united not only the regions of Charlemagne’s Empire, but also Italy and Spain, giving him control of almost all of the lands of the Western Roman Empire. In 1804 he crowned himself Emperor in the presence of the Pope in Paris and adopted the Roman eagle as his standard. France also had an earlier claim as successor of the Eastern Roman Empire in that Andreas Palaiologos, who was heir to the Byzantine Throne after Constantinople had fallen to the Ottomans, sold his rights to the Throne to several European monarchs, including Charles VIII of France. For some time, successive Kings of France continued to lay claim to the Imperial title, but thereafter the claim fell into disuse and ended in 1566 with the reign of Charles IX. Italy can lay claim to be Rome’s successor on the basis of geography since Rome is its capital. Moreover its land area also encloses the seat of the Roman Catholic Church. While this is now confined to the Vatican, the Pope ruled over the much more extensive Papal States from the 8th century until 1870. Moreover, the Italian Renaissance from the 14th to 17th centuries transferred Roman culture to modern era Europe. During the Risorgimento (the movement to unite Italy, which ended in the establishment of the Kingdom of Italy in 1871) Giuseppe Mazzini, one of its leaders, promoted the notion of Italy as the “Third Rome”. According to Mazzini “After the Rome of the emperors, after the Rome of the Popes, there will come the Rome of the people”. Others picked up on this idea, including Benito Mussolini who also used the term “Third Rome” to characterize Fascist Italy and dreamt of establishing an Italian (New Roman) Empire. However, these dreams soon faded and finally ended in July 1943 when Mussolini was deposed. I have to give it to Russia. Since modern countries boundaries are shown, this map is somehow anachronistic. East Prussia (nowadays in Russia) for instance, cannot be considered as having claimed to be a successor state of the Roman Empire. The reverse is true for Switzerland. Why do you show Crimea as part of Russia? This was the choice of the map creator not us. The United States and the Western alliance is the successor to Rome.The empire never fell. If you want to see what a Roamn province would look like if the empire survive into modernity, look at France. Deny all claims from pretenders. The last Emperor of the Romans was Constantine XI who died defending Constantinople in 1453. Interestingly, the Turks referred to their European territory as Rumelia (Land of the Romans) for decades. And, understand that the small Greek Orthodox community still in the city are referred to by the Turks as Rumel (Romans). It’s useless… the Roman Empire is dead, the only descendants of the Romans (who were italics) are those who have the same genetics… the Roman cluster from the ancient patricians graves is R1b U 152, the largest cluster of modern italians… the rest is only copy. Russia is Russia… they can claim an influence, but they are genetically russians, and their Empire is maybe better than the empire of my Roman ancestors……so, Ave Russia, Hail to Russia, but leave aside Rome… we are dead, and we won’t come again. Came here to say that. Rome => Byzantium => Russian Empire => Last surviving piece of the Russian Empire to not become part of the USSR, Finland. Turks conquered the capital of surviving Rome. So, technically they are legal successors.